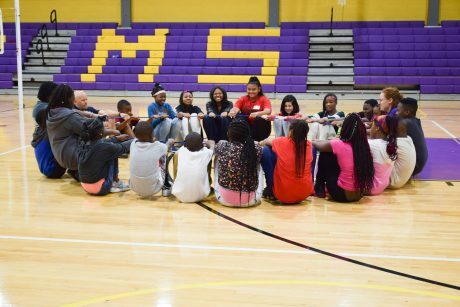 Through empowerment programs, we are able to build leadership, teamwork, and confidence in youth that not only make a brighter future possible, but creates a positive ripple effect on kids’ communities. Life skills: decision-making, problem-solving, creative thinking, effective communication, interpersonal relationships, self-awareness, and coping with emotions and stress. Social responsibility- empathy, valuing group work, caring for the community, appreciating diversity, and conflict resolution. This program provides leadership training for youth 6th-8th grades. Training is held at a school based leadership academy as well as a summer academy for 6th-8th grades. Our summer academy is open to CI youth only. As a part of this program, all youth are invited to participate in game nights, held monthly in the Fall and Spring semester. Our focus with Aflatoun is teaching social and financial education to children and youth in our program. We believe that equipping kids with these tools helps them become agents of change in their own lives. Aflatoun Clubs are currently a part of our A.C.H.I.E.V.E. afterschool and summer programs.